Craig (Tlingit: Sháan Séet) is a first-class city in the Prince of Wales-Hyder Census Area in the Unorganized BoroughA[›] in the U.S. state of Alaska. The population was 1,201 at the 2010 census, down from 1,397 in 2000. Craig has an oceanic climate (Köppen Cfb). Originally, Craig's townsite was a temporary fishing camp used for gathering herring. The commercial fishing industry was responsible for Craig's relatively large population compared to neighboring communities. In the 1930s, record pink salmon runs brought many new settlers. The 1950s saw a collapse of the fishing industry because of depleted salmon populations. In 1972, a large sawmill was established nearby providing a steady source of year-round employment. Today, Craig relies on commercial fishing, fish processing, and the timber industry. On September 7, 1982, the fishing boat Investor was found burning off the coast of Craig, and the boat's passengers and crew were found to have been killed. Due to the badly burned state of the bodies, investigators were only certain that they had recovered the remains of seven bodies, but a coroner's jury ruled that all eight who were aboard the boat had been killed. The boat's owner, Mark Coulthurst, from Blaine, Washington, his wife Irene, and their two young children were among the victims. In September 1984, a suspect, John Kenneth Peel, from Bellingham, Washington, was arrested for the murders. Peel's first trial ended in a hung jury, and his retrial, in 1988, ended in his acquittal. On January 5, 2013 at 3:58 am ET Craig was hit by a 7.5-magnitude offshore earthquake 63 miles (102 km) west of the town. Regional tsunami warnings and advisories were issued. Voluntary evacuations of the town occurred. Despite this, no fatalities, serious injuries, or incidents of damage were reported and the tsunami threat never materialized other than minor, localized sea level rises. Craig first appeared on the 1920 U.S. Census as an unincorporated village. It incorporated in 1922. Craig's demographic characteristics have varied following trends in the commercial fishing industry, from 1980 through 2000 Craig's population more than doubled. As of the census of 2000, there were 1,397 people, 523 households, and 348 families residing in the city. The population density was 209.1 people per square mile (80.7/km²). There were 580 housing units at an average density of 86.8 per square mile (33.5/km²). The racial makeup of the city was 67.07% White, 0.07% Black or African American, 21.69% Native American, 0.57% Asian, 0.57% from other races, and 10.02% from two or more races. 2.79% of the population were Hispanic or Latino of any race. There were 523 households out of which 41.1% had children under the age of 18 living with them, 49.9% were married couples living together, 11.5% had a female householder with no husband present, and 33.3% were non-families. 25.2% of all households were made up of individuals and 3.8% had someone living alone who was 65 years of age or older. The average household size was 2.63 and the average family size was 3.16. In the city, the age distribution of the population shows 31.9% under the age of 18, 7.9% from 18 to 24, 31.8% from 25 to 44, 23.9% from 45 to 64, and 4.6% who were 65 years of age or older. The median age was 34 years. For every 100 females, there were 119.7 males. For every 100 females age 18 and over, there were 118.3 males. The median income for a household in the city was $45,298, and the median income for a family was $52,500. Males had a median income of $41,111 versus $23,558 for females. The per capita income for the city was $20,176. About 7.8% of families and 9.8% of the population were below the poverty line, including 13.4% of those under age 18 and none of those age 65 or over. 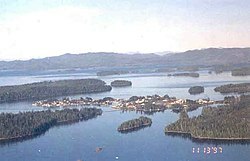 Craig, the island's largest population center and administrative hub for many island companies and organizations, actually has limited-direct transportation off of Prince of Wales Island. Transportation is primarily via floatplane charters at Craig Seaplane Base. Klawock Airport can accommodate wheeled-aircraft and is a short drive away. Inter-Island Ferry Authority provides regularly scheduled year-round ferry service between Ketchikan and Hollis located on the Eastern coast of Prince of Wales island. The Inter-Island Ferry Authority's central offices are located in Klawock. The ferry terminal is located an hour drive outside of Craig and the ferry takes 3 hours to get to Ketchikan, Alaska. There are a few marine shipping companies providing scheduled cargo barge service to South-Eastern, Alaska. Craig is usually one of their ports-of-call, handling inter-modal shipping containers for deliveries to other communities. Prince of Wales Transportation based in Craig, provides island-wide shuttle services from the ferry terminals to the other communities and island attractions. Commercial fishing and related support business comprises the largest portion of Craig's economy. This is supplemented by timber industry related activities like the sawmill, and many residents use subsistence resources in addition to the formal economy. In 2000, Craig had 42 vessel owners with operations in federal fisheries, 84 vessel owners with operations in state fisheries, and 149 registered crew members; 199 residents held 437 commercial fishing permits; 3,405 sport fishing licenses were sold, 2,590 licenses to non-residents of Alaska. Commercial fishing generates much of the income in Craig. There are two harbors in the center of town one which primarily contains smaller charter and recreational boats, and the North Cove Harbor where the trollers, seiners, longliners, shrimp, crab, and dive boats that make up the local fleet are moored. During the peak of the fishing season in summer, the harbor is usually so full that boats must anchor out in the bay. Tourism provides jobs and income to the community. Many charter fishing lodges cater to guests who visit the island for the salmon fishing as well as black bear and deer hunting. The other main employer in Craig is the U.S. Forest Service. The rest of the economy is mainly supportive. There is a city-run medical clinic, a few restaurants, a general store, two banks, a grocery store, a coffeeshop/bookstore, clothing store, gift store, nursery and outdoor outfitter. Craig has an elementary, middle, high school and an alternative school with 35 teachers and about 860 students. City of Craig provides piped water from the North Fork Lake reservoir, as well as providing a public sewage system. Alaska Power & Telephone (an employee owned company) provides hydro-electric power, telephone, and internet service to much of southeastern Alaska, including Craig. There are a few cellular carriers providing service on Prince of Wales Island, mostly to the more densely populated communities like Craig. Holly Madison, one of the stars of the E! channel's Girls Next Door, was raised in Craig. ^ A: Alaska's boroughs are equivalent to counties in other U.S. states. ^ B: Census Areas are abstractions of the U.S. Census Bureau to either consolidate or sub-divide legal-official civil sub-divisions to make counting and presenting population statistics easier and more meaningful. Census abstractions have no legal or official basis in either federal or state law. other than for determining federal electoral boundaries and federal assistance applications. In Craig's case: the Prince of Wales-Hyder Census Area provides a method of subdividing the huge Unorganized Borough (over half of Alaska's area, 374,712 square miles (970,500 km2), an area larger than any other U.S. state, with a population of 81,803, 13% in the 2000 Census), and consolidating Craig statistics with "nearby" communities on Prince of Wales Island along with other "nearby" communities surrounding Ketchikan. 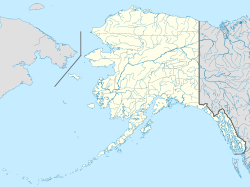 ^ C: Craig incorporated in Territory of Alaska as a second-class city. ^ D: Craig (re-)incorporated as a first-class city in State of Alaska. "City of Craig on Alaska CIS". Alaska Department of Commerce, Community and Economic Development. ^ a b "Alaska Statutes - Title 29 Chapter 03. The Unorganized Borough". Alaska Department of Commerce, Community and Economic Development. ^ "Legislative Directive for Unorganized Borough Review". Alaska Department of Commerce, Community and Economic Development. ^ a b c "USGS detail on Craig (populated place, GNIS ID: 1421260)". Geographic Names Information System. United States Board on Geographic Names, United States Geological Survey, United States Department of the Interior. Retrieved February 18, 2007. ^ a b c d e f g h i j k l m n o p q r s "Community Profiles For North Pacific Fisheries - Alaska/South East Alaska/Craig" (PDF). Alaska Fisheries Science Center, National Marine Fisheries Service, National Oceanic and Atmospheric Administration, United States Department of Commerce. ^ 1996 Alaska Municipal Officials Directory. Juneau: Alaska Municipal League/Alaska Department of Community and Regional Affairs. January 1996. p. 44. ^ a b c "Official site". City of Craig, Alaska. ^ 2015 Alaska Municipal Officials Directory. Juneau: Alaska Municipal League. 2015. p. 49. ^ a b c "Craig city, Alaska". Profile of General Population and Housing Characteristics: 2010 Demographic Profile Data. United States Census Bureau. Retrieved January 17, 2013. ^ "Zip Code Lookup - Find a list of cities that are in a ZIP Code". United States Postal Service. ^ "City of Craig (GNIS ID: 2419374)". Geographic Names Information System. United States Geological Survey. ^ a b "Alaska Statutes Title 29 Chapter 04. Classification of Municipalities". Alaska Department of Commerce, Community and Economic Development. Archived from the original on 2008-09-20. ^ "CRAIG, AK (502227)". Western Regional Climate Center. Retrieved November 19, 2015. ^ a b c d e "Tongass National Forest - Prince of Wales Island communities - Craig". U.S. Forest Service, United States Department of Agriculture. ^ a b c Tibbits, George (October 11, 1985). "Suspect in murder living life on edge". Lakeland Ledger. Associated Press. Retrieved November 7, 2015. ^ a b c "Ex-Crewman Acquitted in 8 Boat Killings in 1982". The New York Times. Associated Press. April 26, 1988. Retrieved November 7, 2015. ^ "7.5-magnitude earthquake strikes off coast of Alaska; tsunami warning canceled". CNN. January 5, 2013. Retrieved January 6, 2013. ^ "M7.5 - 94km W of Craig, Alaska". United States Geological Survey. Retrieved January 6, 2013. ^ "Prince of Wales Island Community Profies - Craig". Prince of Wales Island Chamber of Commerce. ^ "Prince of Wales-Outer Ketchikan Census Area: Economic Overview". Alaska Department of Commerce, Community and Economic Development. ^ "Inter-Island Ferry Authority". Inter-Island Ferry Authority. ^ "Prince of Wales Island Transportation - Craig". Prince of Wales Island Chamber of Commerce. Archived from the original on 2008-05-13. ^ "Prince of Wales Island guide - 2007" (PDF). Prince of Wales Chamber of Commerce. ^ "Prince of Wales Island - Utilities". Alaska Department of Commerce, Community and Economic Development. ^ "United States Code Title--13 Census". Government Printing Office. Archived from the original on February 15, 2008. ^ "Alaska Statutes". Alaska Legislature. This page was last edited on 4 November 2018, at 02:29 (UTC).